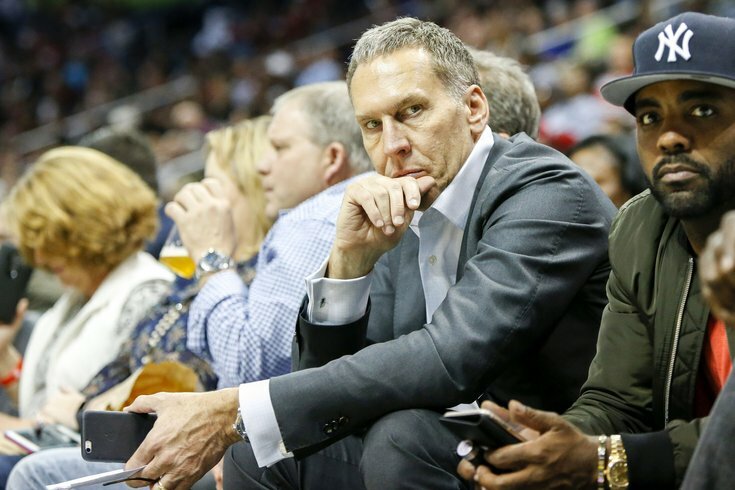 Philadelphia 76ers president of basketball operations Bryan Colangelo watch a game against the Atlanta Hawks in the third quarter at Philips Arena. The Hawks won 110-93. The odds were always leaning this way, and the numbers ended up being reasonable in the end. Your Philadelphia 76ers will be on the clock at No. 10 in June, following a 2018 NBA Draft lottery that went as expected for the Sixers. It always sounds nice to dream about lightning striking and a team moving all the way up to No. 1, but with 87 percent odds to stay exactly where they did, no one should be surprised by the outcome. This is the spot the Sixers have likely been spending more time planning for, and now the effort begins to start focusing on draft prospects in earnest. A few preliminary names for Sixers fans to keep an eye on: Villanova's Mikal Bridges, Kentucky's Shai Gilgeous-Alexander and Kevin Knox, Alabama's Collin Sexton, Michigan State's Miles Bridges, and Oklahoma's Trae Young if he ends up tumbling down the draft board a bit. The Villanova Bridges was a favorite around these parts for some time, but Philadelphia's playoff series against the Boston Celtics should call into question how sustainable the team can be long-term if they don't get more ballhandlers on the floor. Bridges is many things, but he should not be expected to assume a ton of on-ball playmaking duties at the NBA level. The uncertainty around Markelle Fultz makes like difficult for Philadelphia in this draft, this summer's free agency, and really across the board on a long-term level. If the Sixers can't rely on Fultz moving forward, they are in desperate need of more ballhandlers to put on the court and supplement the talents of Joel Embiid and Ben Simmons. There's not exactly a perfect fit in this crop of players, especially at No. 10 when you're starting to dip into lower tiers of prospects. Bryan Colangelo has his work cut out for him here, and the other remaining question will be whether Philadelphia uses this pick at all. During his exit interview with the media last Friday, Colangelo talked openly about trades being another potential avenue for their acquisition of a big piece over the next two summers, and with their own picks beginning to trend away from lottery territory, this is likely to be the last high-value first they have in the foreseeable future. Is that more valuable to them as trade currency, or in the form of a young prospect who they can keep on a rookie-scale contract and develop alongside their other core guys? A Kawhi Leonard trade is a bit tougher to make with only the No. 10 pick instead of the No. 1 overall, but keeping the pick at all leaves the Sixers with options to work with. You will hear a lot of trade rumors emerge from the practice facility in Camden, whether that's on Philadelphia's end or teams trying to drive up the value of their own picks and players by floating the Sixers in rumors. We'll go deep on plenty of prospects here over the next month-and-a-half to prepare you for Philadelphia's potential selection in June. This isn't the most exciting outcome in the world, but it could have gone a lot worse.